Popular Nigerian musician Wizkid has stated that he would love to one day get married and if opportunity presents itself, he will get married to his baby mamas. The music star was a guest at Urban FM where he made the revelation. According to Wizkid who was answering questions concerning his relationship with record mates, R2Bees, he called them, family and also got to confess his for love Ghana. He also revealed that he would love to relocate to Ghana at a later point in his life. “I feel like when I get old like my young girlfriend I’ll just relocate to Ghana by the beachside,” he said. He also went on to talk about his relationship with all the women in his life. When asked if he would ever marry, he said if all the women in his life decide to marry him someday, he would marry all of them. Wizkid had earlier opened up that he does not think he could maintain a monogamous relationship and his girlfriends understand him to be a man that loves women so much. Wizkid has three baby mamas who gave birth to his three sons. Sola Ogudu who at the age of 19 met Wizkid and soon enough was pregnant with him. Sola Ogudugu is the pop star’s first baby mama. “I remember the day I found out I was preggers! After 5 monthsss… Damn!!! I Swear I died and rose again!” she revealed in 2015 to Y Naija. Wizkid and Sola have a cordial relationship and the pop star is much involved in the life of their son, Boluwatife. 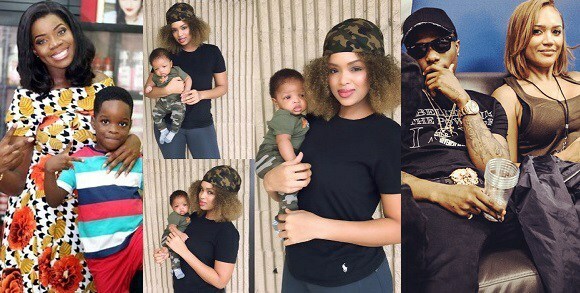 Then we have Binta Diamond Diallo who in January 2016, revealed that Wizkid was the father of her newborn baby son. Wizkid had denied this but Diallo remained adamant. She is the mother of Wizkid’s second son, Ayodeji.